The names are rather horrible, so I think that from now on I'll just refer to them as D4, D6, D8, D10, D12, D14, D16, and D20. The number of edges that meet at a vertex is its valence. Vertices in convex deltahedra have valences of 3, 4, or 5. The valence can't be larger than 5 because only six equilateral triangles will fit, and if you fit 6 then they lie flat and the polyhedron is not properly convex. There's a clear pattern here, with V3s turning into V4s two at a time until you reach the octahedron (D8) and then V4s turning into V5s one at a time until you reach the icosahedron (D20). But where is V4=1, V5=10? There's a missing deltahedron. I don't mean it's missing from the table; I mean it's missing from the universe. Well, this is all oversubtle, I realized later, because you don't need to do the V3–V4–V5 analysis to see that something is missing. There are convex deltahedra with 4, 6, 8, 10, 12, 14, and 20 faces; what happened to 18? Still, I did a little work on a more careful analysis that might shed some light on the 18-hedron situation. 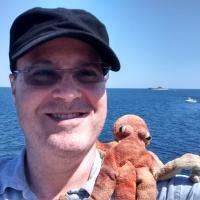 I'm still in the middle of it, but I'm trying to continue my policy of posting more frequent, partial articles. Let V be the number of vertices in a convex deltahedron, E be the number of edges, and F be the number of faces. We then have V = V3 + V4 + V5. We also have E = ½(3V3 + 4V4 + 5V5). And since each face has exactly 3 edges, we have 3F = 2E. By Euler's formula, F + V = E + 2. Plugging in the stuff from the previous paragraph, we get 3V3 + 2V4 + V5 = 12. Solutions in green correspond to convex deltahedra. What goes wrong with the other 11 items? (3,1,1) fails completely because to have V5 > 0 you need V ≥ 6. There isn't even a graph with (V3, V4, V5) = (3,1,1), much less a polyhedron. There is a graph with (3,0,3), but it is decidedly nonplanar: it contains K3,3, plus an additional triangle. But the graph of any polyhedron must be planar, because you can make a little hole in one of the faces of the polyhedron and flatten it out without the edges crossing. Another way to think about (3,0,3) is to consider it as a sort of triangular tripyramid. Each of the V5s shares an edge with each of the other five vertices, so the three V5s are all pairwise connected by edges and form a triangle. Each of the three V3s must be connected to each of the three vertices of this triangle. You can add two of the required V3s, by erecting a triangular pyramid on the top and the bottom of the triangle. But then you have nowhere to put the third pyramid. On Thursday I didn't know what went wrong with (2,2,2); it seemed fine. (I found it a little challenging to embed it in the plane, but I'm not sure if it would still be challenging if it hadn't been the middle of the night.) I decided that when I got into the office on Friday I would try making a model of it with my magnet toy and see what happened. It turned out that nothing goes wrong with (2,2,2). It makes a perfectly good non-convex deltahedron. 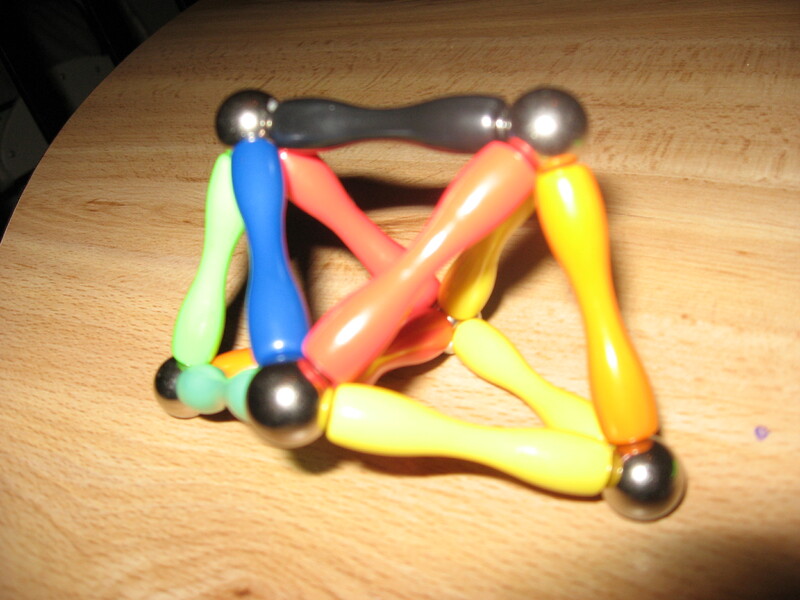 It's what you get when you glue together three tetrahedra, face-to-face-to-face. The concavity is on the underside in the picture. (2,0,6) was a planar graph too, and so the problem had to be geometric, not topological. When I got to the office, I put it together. It also worked fine, but the result is not a polyhedron. The thing you get could be described as a gyroelongated triangular dipyramid. 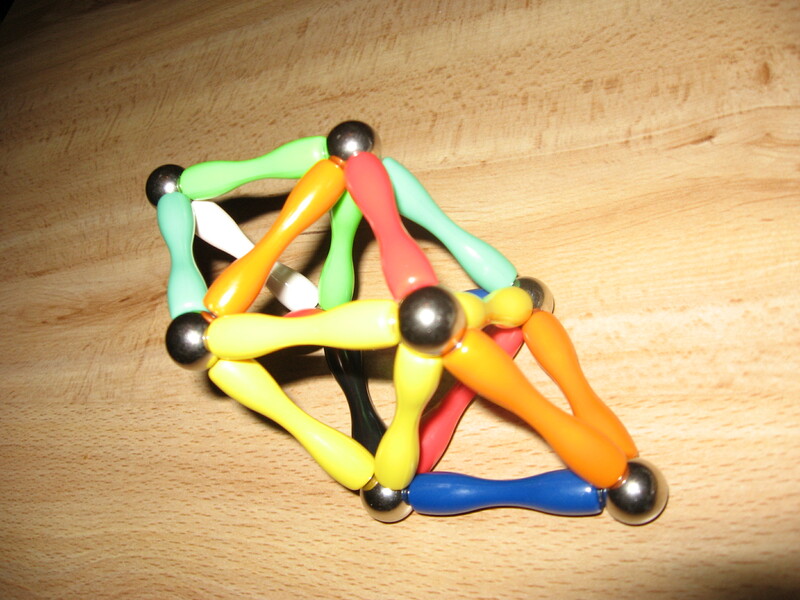 That is, you take an octahedron and glue tetrahedra to two of its opposite faces. But then the faces of the tetrahedra are coplanar with the faces of the octahedron to which they abut, and this is forbidden in polyhedra. When that happens you're supposed to eliminate the intervening edge and consider the two faces to be a single face, a rhombus in this case. The resulting thing is not a polyhedron with 12 triangular faces, but one with six rhombic faces (a rhombohedron), essentially a squashed cube. 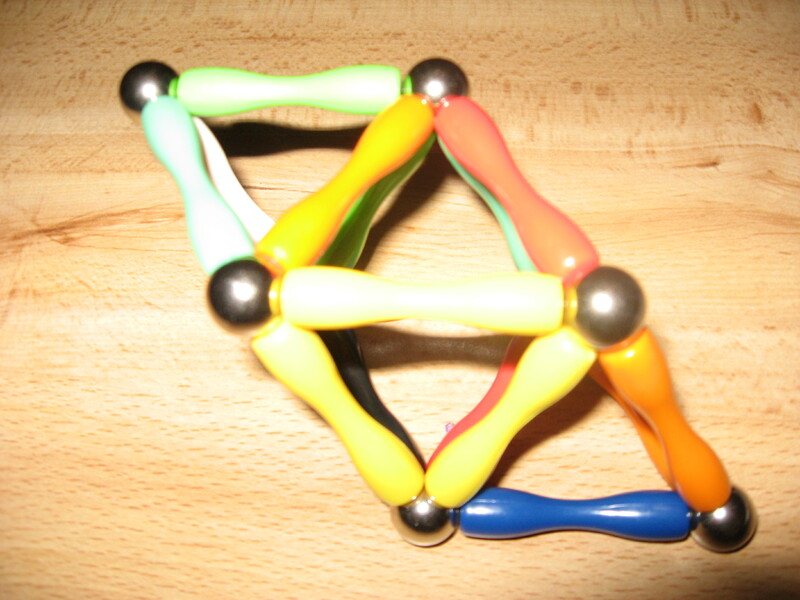 In fact, it's exactly what you get if you make a cube from the magnet toy and then try to insert another unit-length rod into the diagonal of each of the six faces. You have to squash the cube to do this, of course, since the diagonals had length √2 before and length 1 after. So there are several ways in which the triples (V3,V4,V5) can fail to determine a convex deltahedron: There is an utter topological failure, as with (3,1,1). There is a planarity failure, which is also topological, but less severe, as with (3,0,3). (3,0,3) also fails because you can't embed it into R3. (I mean that you cannot embed its 3-skeleton. Of course you can embed its 1-skeleton in R3, but that is not sufficient for the thing to be a polyhedron.) I'm not sure if this is really different from the previous failure; I need to consider more examples. And (3,0,3) fails in yet another way: you can't even embed its 1-skeleton in R3 without violating the constraint that says that the edges must all have unit length. The V5s must lie at the vertices of an equilateral triangle, and then the three unit spheres centered at the V5s intersect at exactly two points of R3. You can put two of the V3s at these points, but this leaves nowhere for the third V3. Again, I'm not sure that this is a fundamentally different failure mode than the other two. Another failure mode is that the graph might be embeddable into R3, and might satisfy the unit-edge constraint, but in doing so it might determine a concave polyhedron, like (2,2,2) does, or a non-polyhedron, like (2,0,6) does. I still have six (V3,V4,V5) triples to look into. I wonder if there are any other failure modes? I should probably think about (0,1,10) first, since the whole point of all this was to figure out what happened to D18. But I'm trying to work up from the simple cases to the harder ones. I suppose the next step is to look up the proof that there are only eight convex deltahedra and see how it goes. I suspect that (2,1,4) turns out to be nonplanar, but I haven't looked at it carefully enough to actually find a forbidden minor. One thing that did occur to me today was that a triple (V3, V4, V5) doesn't necessarily determine a unique graph, and I need to look into that in more detail. I'll be taking a plane trip on Sunday and I plan to take the magnet toy with me and continue my investigations on the plane. In other news, Katara and I went to my office this evening to drop off some books and pick up some stuff for the trip, including the magnet toy. Katara was very excited when she saw the collection of convex deltahedron models on my desk, each in a different color, and wanted to build models just like them. We got through all of them, except D10, because we ran out of ball bearings. By the end Katara was getting pretty good at building the models, although I think she probably wouldn't be able to do it without directions yet. I thought it was good work, especially for someone who always skips from 14 to 16 when she counts. On the way home in the car, we were talking about how she was getting older and I rhapsodized about how she was learning to do more things, learning to do the old things better, learning to count higher, and so on. Katara then suggested that when she is older she might remember to include 15.